In Salt Lake City you can have drug charges brought against you in justice court or district court depending on the severity. 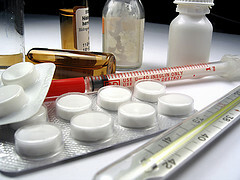 For years now drug charges have been a huge part of the criminal justice system, a large number of the cases currently in the court system deal directly or indirectly with the possession, production, and distribution of drugs and many more stem from individuals committing offenses as a result of drug use or to help sustain their drug use. When it comes to drug charges the two factors that are most telling of what level of offense the individual will be charged with are the type of drug and the amount of the drug. As for the type of drug, on one end of the scale you have marijuana, which is most likely considered the least hard drug on the list of controlled substances and on the other end of the scale you have heroin, cocaine, and methamphetamine. So if an individual is caught with a small amount of marijuana they will probably be facing a class B misdemeanor charge, and if they had a large amount of heroin instead then they would be facing felony drug charges. There are basically three types of drug charges when it comes to controlled substances and they are all quite self explanatory of what they entail. The offenses are possession, distribution, and production. Possession is the least serious of the three types of offenses and Distribution and Production are treated fairly equally. To be able to prove distribution the state must show some evidence of the intent to distribute. What this means in practice is that the only difference often between a possession charge and a distribution charge is that the cops found a couple of baggies or a scale with the controlled substance which the state then uses to show that there was an intent to distribute. Finally, the last two things to consider when determining the gravity of a drug charge is whether the offense took place in a drug free zone and whether or not the individual has a criminal history of previous drug crimes. In an attempt to protect children from the ill effects of drug and the criminal enterprises surrounding them the legislature has drafted into the criminal code a drug free zone enhancement which means that if a drug crime is committed in a drug free zone it can be charged at one step higher than it would normally be. Meaning a charge that would normally be a class B misdemeanors would be charged as a class A misdemeanor if it took place in a drug free zone, and a class A misdemeanor would be a 3rd degree felony and so forth. The drug free zones are defined by the distance from certain areas, which include for example 1000 ft from schools, parks, and churches. Additionally, in the same way a drug free zone increases the level of a drug crime a previous conviction of a drug crime can also increase the level of a charge. The most common example of this is that a possession of marijuana charge of less than an ounce of marijuana which is usually a class B misdemeanor can be charged as a class A misdemeanor if the individual already has a marijuana possession conviction. Although drug use has been criminalized in America, it still carries a different stigma then other crimes because of the fact that drug use includes addiction. As a part of this prosecutors are often flexible in the types of deals that defense attorneys can work out with them if there are signs that the defendant is working on dealing with their addiction. With the help of a good attorney you could reduce the level of charge you are facing and/or the possible penalties you could be facing by getting treatment, drug testing, or possibly applying to the drug court program. If you are facing a drug crime charge then make sure and call the lawyers at Criminal Defense Attorney Salt Lake City to learn more about your case and to get help protecting yourself.